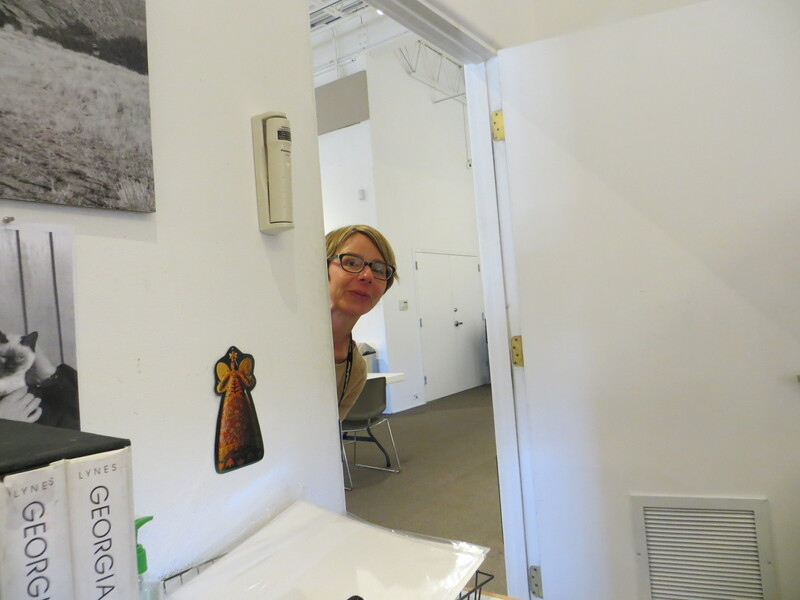 Sarah, my supervisor, rounds the corner with a sly look that slowly signifies she has something fantastic to show me. I hadn’t, but, time to time, I had passed a set of unassuming double doors in the hallway between myself and the tea-depot (a place I make an hourly pilgrimage to) which called to me with a whiff of pastel and canvas flavored magic as I walked by, and my interest was immediately peeked. As if anticipation was planned into the architecture of the rooms Sarah flips the light switch, not inside the room itsself but in the hallway, illuminating the cracks like a cupboard into Narnia, and hauls open the double doors while angels sing in choir. This is no craft room, it’s a craft Kingdom! Paints, canvas, brushes, pastels, pencils, erasers, sequins, buttons, yarn, glue, clay, plaster, sketchpads, pens, ink, needles and thread are the subjects, and the smell of electric-kinetic possibility, like the feel of something just before it touches your fingertips reigns queen. From this secluded holy place, this alcove of innovation, educational projects are quarried. Like constructing a wall, these supplies are the stone and creativity is the mortar. Buuuuut I might have just stood there and nodded. I was afraid in the face of so many art supplies I would black out suddenly and wake like a werewolf, not able to remember the last 8 hours, hands, face and apron covered in blood red chalks and midnight black charcoal, stammering “W-w-w-w-w-have I done!” as I half piece together a memory of howling at the moon, palate and knife in hand. This last Friday was First Friday Art Walk; to celebrate, I assisted Shannon Bay in a gallery activity that involved viewfinders and sketch pads. Fun! Patrons could walk around the museum and look at art, the shadow of a wall or perhaps the cracks on our stone floor in imitation of Georgia O’Keeffe and her unique way of viewing the world. 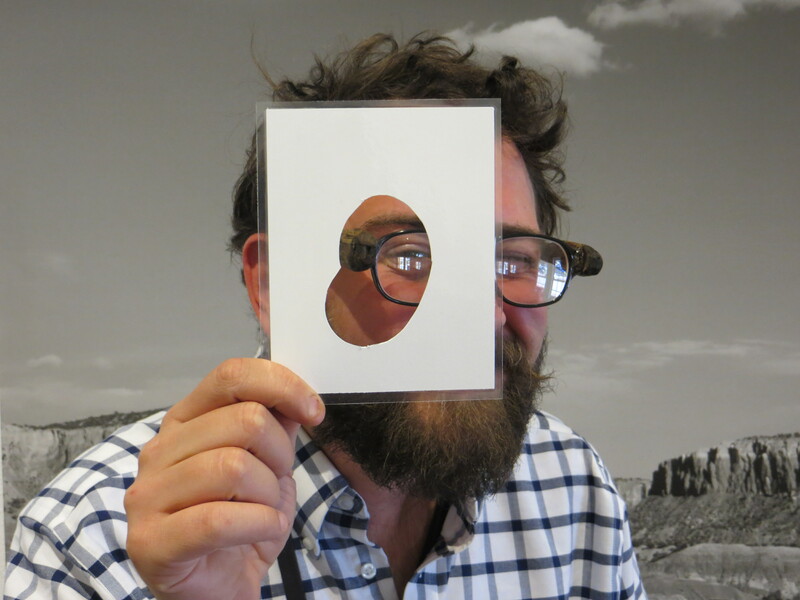 A photo in our gallery shows O’Keeffe looking through a slice of swizz cheese, and, inspired by this, a part of me wished we could use cheese as well. Then the hungry part of me realized that I would just eat my viewfinder. Then the child in me examined his cheese covered fingers while the adult in me watched crumbs accumulate in our beautiful gallery. I’m sorry, Georgia, we don’t all have your restraint. These laminated card-stock viewfinders work just fine! February 11, 2015 in Education.